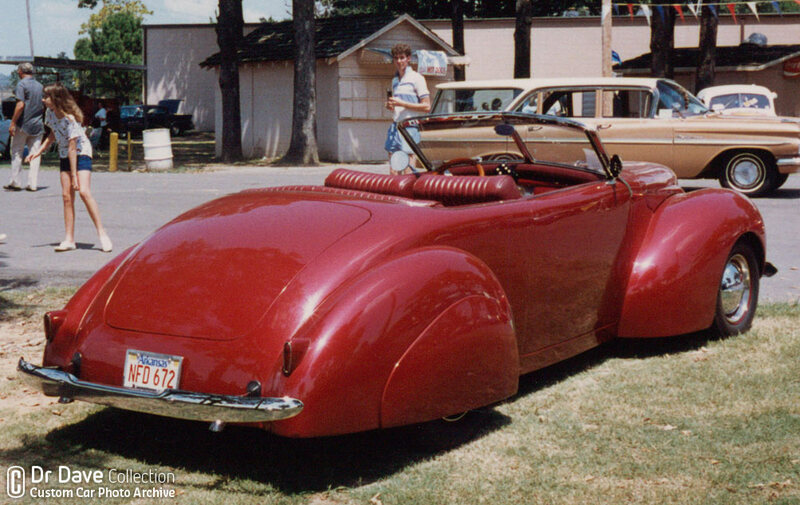 Originally built in 1940 by Coachcraft Ltd for Clarence Solomon, this 1940 Ford based Custom has been owned by Tex Myers since the early 1980’s. an previous CCC article we told the story about J.W. Tidmore who owned this car in the mid to late 1950’s. 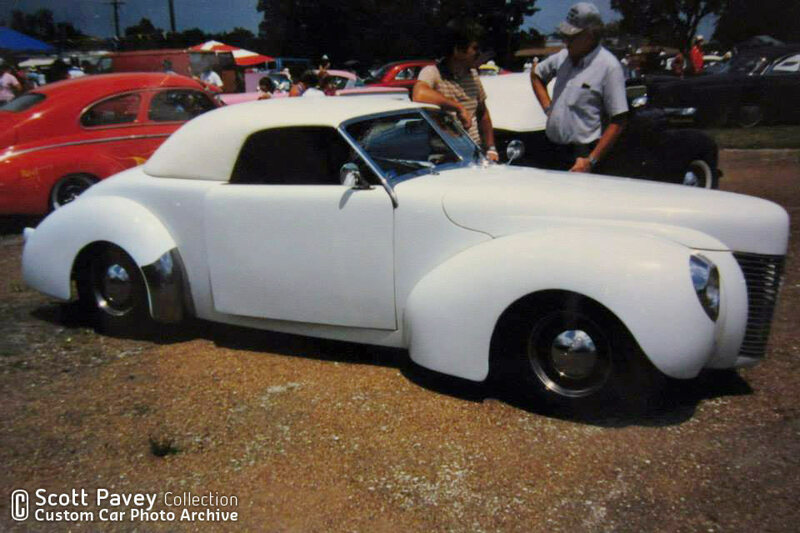 In this article we will highlight the years this classic custom is owned by Kansan residence Tex Meyers. In un upcoming article we will highlight the early stages of this car. It is amazing that this car is still around, and still in very good shape, although styled a bit different from its original classic custom looks. This is how the car was originally built by Coachcraft Ltd. for Clarence Solomon. Tex came across this car in 1981, it had been sitting in a field for many years rotting away. It was in bad shape, with all the original wood structure created by the Coachcraft shop all rotten away. Some of the metal work was rusted, but not bad enough for Tex to let this really great looking sports convertible sit and rot further. He took it home not knowing what he had found. All he knew was that he really liked the shape of the body and the windshield. He dreamt of rebuilding the car to his ultimate sports car, and drive it as much as he could. Some time after Tex had taken the car home he found out the history on the car. That it was originally built by Coachcraft Ltd. on Melrose Avenue in Los Angeles in 1940 for Clarence Solomon, who later sold it to movie camera man James Wong Howe. In the early 1950’s the car was located in Texas and the drive train was rebuilt. Later it was owned by J.W. Tidmore who sold it in the late 1950’s to an unknown buyer. Who owned it after that is unknown at this moment. But somehow the car was put in a field in Traskwood, Arkansas and left there for several years to rot. If you compare this photo with the black and white one above you can see the whole style of the car was changed with the use of the smaller diameter black wall tires and lower profile removable top. Tex did bring back the solid grille sides which had been replaced with stock units in the mid 1950’s. The lower profile fiberglas top now sports an oval rear window while the original one had a squire, much larger opening. The rest of the Coachcraft details like the ’40 Packard taillights are still there. 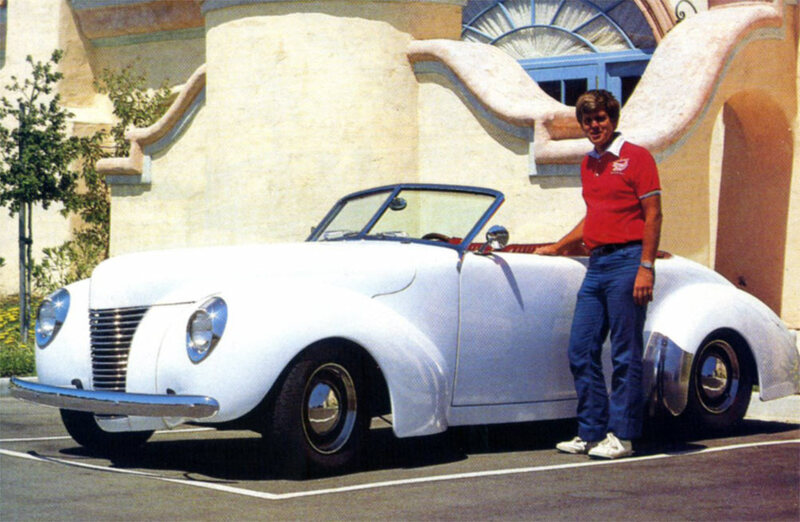 Tex Myers posing with his first version of the Coachcraft Ford. With the Coachcraft created wood frame now gone Tex recreated a new frame from metal, and did the necessary body repair work. 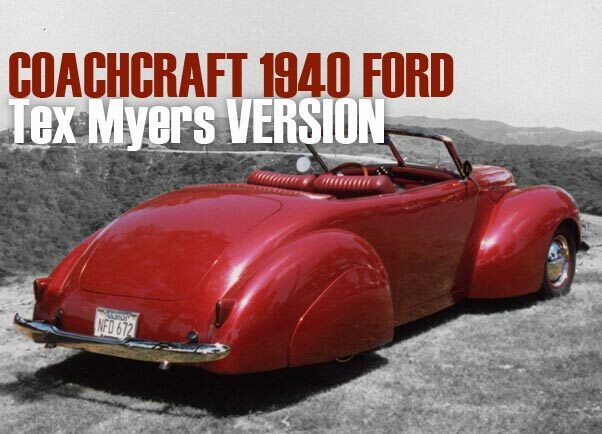 When Text worked on the body he started to realize that this body was not based on a 1940 Ford as he thought in the beginning, but that it was a body handcrafted by the Coachcraft team. Only the rear fenders are unmodified stock 1940 Ford units. Even though Tex knew about the cars origins and how it originally looked he choose to add his own touches. Fortunately he left most of the body as how it came from Coachcraft. The only obvious change he made was a new top, but only since the original top was long gone. Tex recreated a new one from fiberglass, and has a much lower profile than the original steel top had. 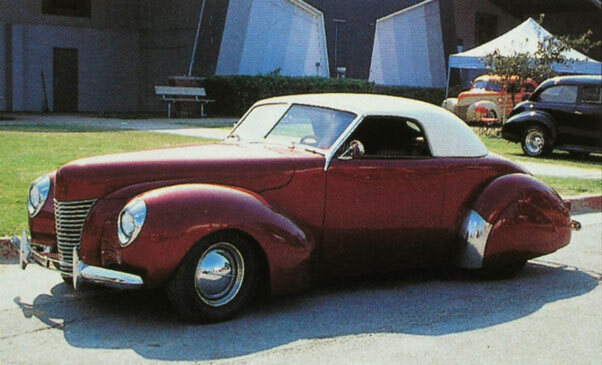 Tex also added 1940 Ford bumpers, when he was unable to find 1941 Lincoln Zephyr units. 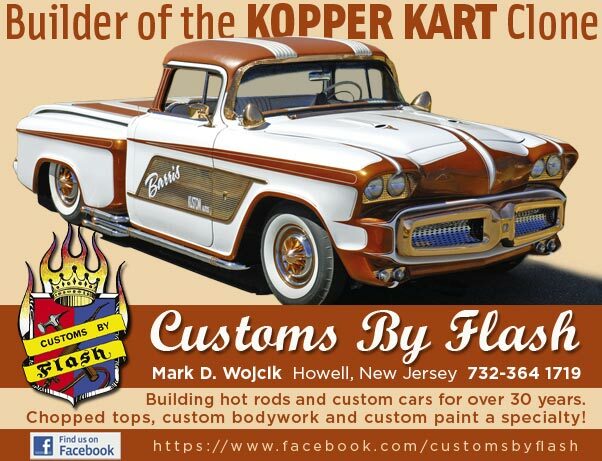 (The car also had 1940 Ford bumpers in the mid 1950’s for the same reason). The brass windshield was still in perfect shape only needing to be re chromed and new glass made for it. 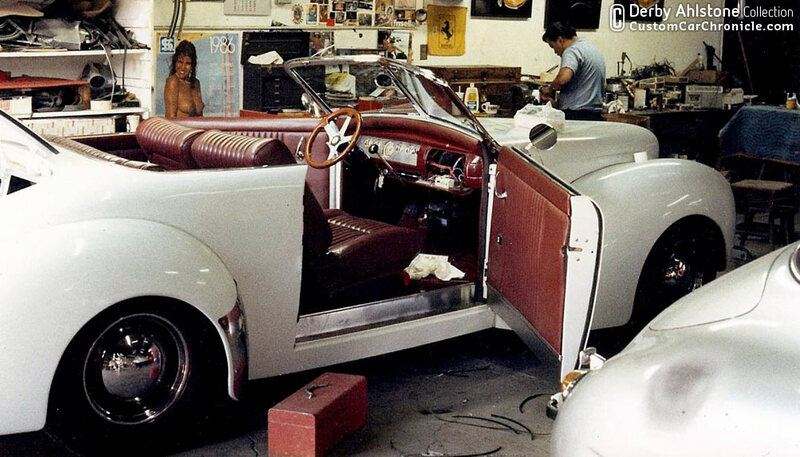 The car had been sitting without a top, so the original interior was all gone, or what was left could not be repaired. Tex used 1983 Lincoln power seats covered in red leather. He also modified the dash by adding an aluminum panel filled with Classic Intrument gauges, and a Grant wood rimmed steering wheel. In 1985 Tex finished the rebuilt and sprayed the car with white lacquer paint. He added 1940 Ford wheels pained dark maroon and added 1940 Ford hubcaps and beauty rings on black wall radial tires. The rebuilt car now looked quite different from its original version. Especially the much smaller black wall tired an the skirt-less rear fenders gave the car a more sports-car feel. The interior was completely redone. 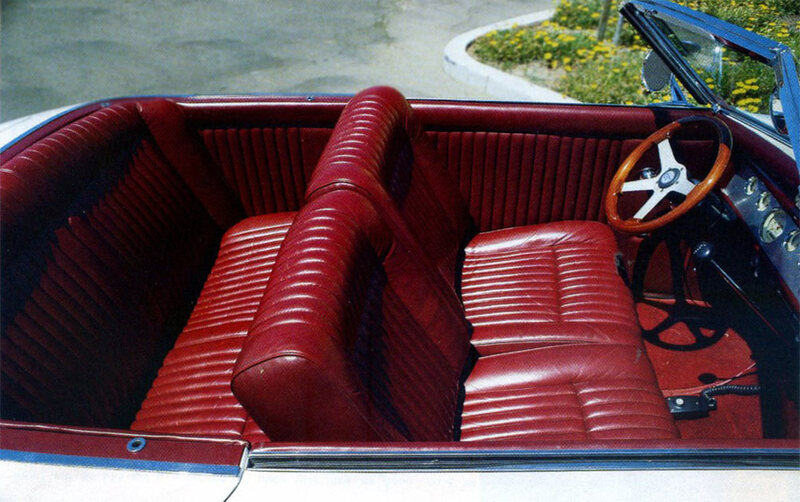 ’83 Lincoln powerseats and matching rear bench were upholstered in dark red leather. The wood Grant steering wheel and aluminum dash insert are also new. This photo taken at the Coachcraft shop in 1986 shows that the body was channeled over the frame. In 1986-87 Tex rebuild the car once more. He had located a 1941 Lincoln Zephyr bumper, as well as some flipper hubcaps and tear drop shaped fender skirts. 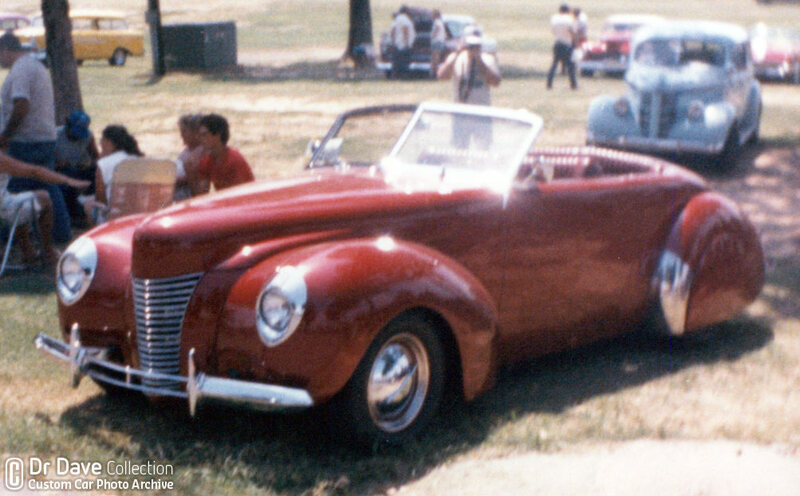 The car was repainted in dark red, and the Lincoln bumper was added to the front and an 1940 Mercury units to the back. The fender skirts were mounted just like the original version had and the Flipper hubcaps added. The flipper hubcaps on the original version were created by George DuVall and where smaller in diameter, but the once Tex used now are already a huge improvement over the 1940 Ford units he used on the white version. But the much smaller black wall radial tires remain. The new dark red paint changes the looks of the car once more. The addition of the Lincoln bumper and the fender skirts brings it closer to its original looks. This rear shot shows the more elegant 1940 Mercury bumper used on the rear for this version. This Street Rodder magazine scan shows how good the white top looks with the dark red body. Go to the J.W. Tidmore STORY on this Coachcraft Custom. Great article, really love most of the cars that came out of the Coachcraft shop. Looking forward to read about the early years. 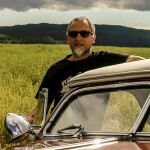 Great site Rik , I enjoy every article . Very informative . Thank You for all the work you put in to this site. Great research. Really enjoy following the trail of this very special Coachcraft sport roadster. Can’t think of another that blended the coachbuilt and the custom approaches to styling. So many elements you call to our attention. Thank you, Rik. Another CCC in-depth first.